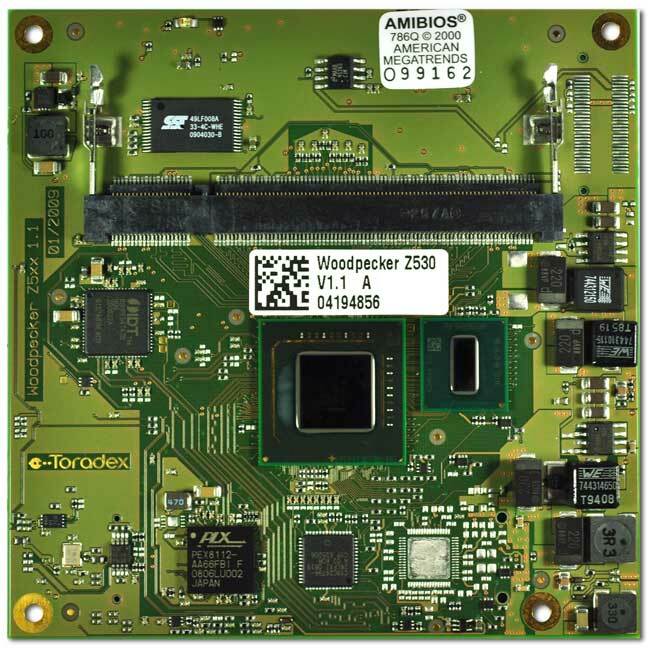 Woodpecker Z530 and Z510 are embedded Micro CoM Express™ computer modules based on the Intel® Atom™ Z530 and Z510 processors and the Intel® System Controller Hub US15W. The Intel® Atom™ Z530 processor runs at 1.6GHz and is designed for high performance computing with low power consumption. The low cost module Woodpecker Z510 features the Intel® Atom™ Z510 processor which runs at 1.1GHz. Woodpecker Z530 offers 2 PCI Express x1 lanes, PCI interface and up to 6 High Speed USB ports for fast signal connectivity. One USB port can be configured as USB client. The module features in the standard configuration a dual independent graphic output with SDVO and LVDS output, or alternatively a VGA and LVDS interface. Woodpecker provides a wide range of interfaces for mass storage device. A master and slave PATA interface supports up to two IDE devices. Additionally, two SATA interfaces are available. A microSD card slot is provided on the module for convenient memory extension. A 30 pin FFC connector features two additional SDIO channels for SD cards, MMC cards, WLAN adaptors, Bluetooth adaptors, modems, IrDA adapters, RFID readers or GPS modules. The CoM Express Carrier Boards for Woodpecker are ideally suited for a wide range of industrial applications with long term availability. Designed as flexible environment for exploring functionality and performance of the modules or ideal for short time to market with reduced development risk. The Woodpecker Z530 and Woodpecker Z510 have been discontinued by end of 2012. Please contact the Toradex support for more information.